The SAGE Commission’s recommendations to make huge cuts to the Postal Service came as a big blow to workers, union bosses have admitted. But BPSU chiefs maintain that the service still has a role to play in Bermuda and could look to offer other community services to make it more viable moving forward. 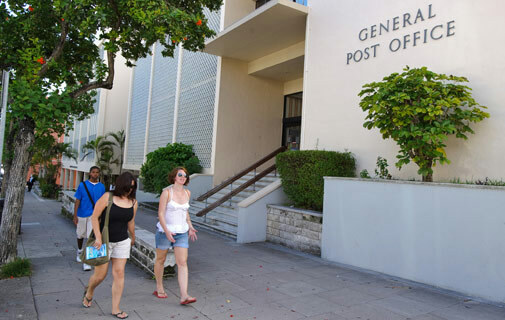 Wendell Burchall, third vice-president of the BPSU and responsible for the Postal Service, told the Bermuda Sun: “Nobody is very impressed with the recommendations in SAGE that basically say ‘X’ amount of people are going to be put out of work. “It’s something that in these economic times we are not in favour of. “But we must remember they are only recommendations. “It’s easy to just cut from an economic standpoint as opposed to look at the impact it will have in the community. “We will never discount anything; we need to sit down and have discussions with Government about what is do-able and not do-able. The SAGE Commission recommended slashing the number of Post Offices from 13 to just three — in the east, the west and Hamilton. And the commission’s final report claimed that there are over 100 too many staff in the service. It also put forward the idea of abolishing home deliveries in favour of batch delivery boxes. Mr Burchall added: “We need to ask the public what service they want. “The idea of suspending home deliveries; that’s up to the public. “If the public say they are willing to pay for home deliveries how can we say we are not going to offer it? “We will examine the recommendations contained in SAGE and go through them with a fine-tooth comb. The BPSU represents around 40 per cent of postal workers including office staff as well as postmasters and mistresses. The rest of the service’s employees, which include those responsible for delivering the mail, are represented by the BIU. Mr Burchall added: “There is still a role for the Post Office to play and that role is defined by the public.